Coach Norman with West High Volleyball has been named Region 6 Coach of the Year. “It is an honor to work with the West High School Panthers, the players are amazing, fun and highly motivated for excellence. This year has been so amazing” Norman The team went undefeated in region and earned 5th at State. 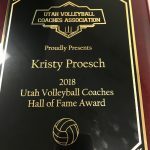 Kristy has been at a West for over 20 years and has recently received the Utah Hall of Fame Award for 2018. 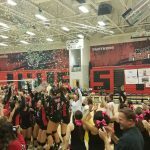 “I coached High School Volleyball for 23 years and College for 2. I am honored and humbled to receive this award”. Congratulations Kristy! 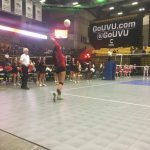 Volleyball won in 3 matches 25-23, 25-14, 25-23 Thursday night at Olympus. Next game is October 23 at Highland. 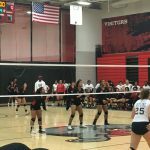 Girls volleyball wins in 3 matches against East High School.